Cleethorpes Childcare are an Incorporated Charity. This means we are registered as an educational Charity with the Charities Commission and we are also a Company Limited by Guarantee. We consist of Signhills Pre-school, Highgate Pre-school, Hardys Den out-of-school and holiday clubs and Creche Services. We are proud to play an active part in the local communities and encourage participation by all members and their families. Signhills Pre-school was established in 1992, beginning its’ life originally as a development leading from a small group of parents and children joining together on a regular basis in the home of Margaret Avery. Very shortly, it became apparent that there was a need for a playgroup in the area and so a room was hired and the group became known as Kings Road Playgroup. Three years later, the group moved onto Signhills School site and became known as Community Playgroup at Signhills. The success of Signhills Playgroup became apparent when the number of children on the waiting lists continually exceeded the places available and so, with this in mind, a second provision at the Annie Chapple Community Centre opened in January 1998. Initially this group catered for the younger children who were waiting to attend Signhills Pre-school, however Annie Chapple established itself as a Pre-school group for all ages and catered for a much wider catchment area. Annie Chapple tended to liaise closely with Middlethorpe School as the feeder school for the majority of our children therefore it seemed a natural progression when we successfully bid for funding to secure premises within the school grounds and changing our name to Middlethorpe Pre-school. Middlethorpe Pre-school closed in July 2017. Cleethorpes Childcare was established as an incorporated registered charity in 2003. Prior to this we were known as Signhills and Annie Chapple Pre-schools. As we developed existing services, we also identified potential for reviewing our staffing structure and created a corporate identity which would take us forward in the childcare sector. We are run by an active parent management committee who employ staff, agree and monitor finances and arrange fundraising activities and events throughout the year, amongst many other things! Committee members and staff continually review, evaluate and reflect on provision to ensure we provide for the current needs of the community, legislation, and local issues. A successful bid to New Opportunities Fund (NOF) for a start up grant, enabled Hardys Den to open on 2nd November 2003 with a provision of before and after school care to coincide with new premises for Signhills Pre-school. This extension to school hours has proved extremely popular with children aged between 4 and 11 years with the vast majority coming through from Signhills Infant and Junior Schools. An invitation from St Josephs Catholic Primary School to open a new pre-school facility proved too good an opportunity for us to refuse and Little Joes Pre-school opened it’s door on 8th January 2007. As our smallest pre-school offering 20 places per session, Little Joes has proved very popular and an asset to preparing children for school life however, this provision closed in July 2015 due to St Josephs Academy requiring the classroom space we occupied. Following the opening of Highgate Children’s Centre in September 2008, Cleethorpes Childcare signed a Service Level Agreement to become the preferred provider for childcare services. In light of this, we provide a team of crèche workers which facilitate a learning experience for children attending The Hub, whilst their parents attend meetings or training sessions on-site. We continue to develop our provisions to meet the needs of the local community and are grateful for the opportunities partnership working provides for us. Highgate Pre-school opened its doors within Highgate Children’s Centre in October 2015 working in partnership with The Hub and Thrunscoe Academy as well as other nearby settings. Signhills Pre-school moved into a new building which expanded our capacity to 36 places each morning & afternoon from September 2015. The excellent relationship with both Signhills Academies has been strengthened by our positioning as we are now near to the front entrance meaning parents are able to call in to register their child with us when taking siblings to/ from school. 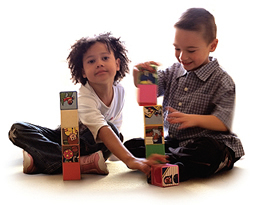 Young children learn considerably through play activities. Cleethorpes Childcare aim to provide the opportunity for children to fully develop their mental and physical potential in a safe, secure and stimulating environment. All adults within our settings are committed to ensuring equality of opportunity for all children and families and the involvement of parents and carers in every aspect. We are very proud of our uniqueness in providing high adult to child ratios within our provisions offering a minimum of 1 adult to 6 children aged 3-8 years, 1:4 for 2 year olds and 1:3 for 0-2 year olds. We are also proud of our membership of the Pre-School Learning Alliance. This membership ensures that we are kept up to date with the new thinking in the field of education and childcare and have access to training towards recognised qualifications. We hope our children and families enjoy their time with us; joining in with events, activities and their children’s learning and development.